Home » Reviews and Publicity » Agatha Raisin’s on TV! One Response to Agatha Raisin’s on TV! Hoping that my public owned PBS network in the Philadelphia area will be the recipient of the Agatha Raisin Mystery Series. I’ve read and re-read all of M.C. 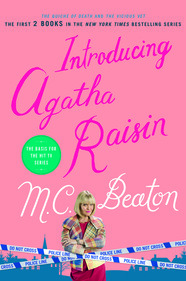 Beaton’s Agatha Raisin as well as Hamish MacBeth books. Her characters are so pleasantly flawed yet filled with such kindness that you are always pleased when they solve the case with their insights and ingenuity. Can’t wait till her next book release .